We hope you can make it to our workshop on Thursday 20th September – lots of other great workshops on. All part of the Unforgettable launch of the Caregiver’s club and news of their new music player. Come and see us at 3.50pm. The workshop will introduce you to Music & Memory and why personalised music is so powerful for people living with dementia. We will explore how you can use personalised music to support and extend care in ways that work for you. From the workshop you will learn how to be a music detective and start creating a playlist. See you there! We are delighted to invite you to our FREE get together for caregivers in London on 20th September. 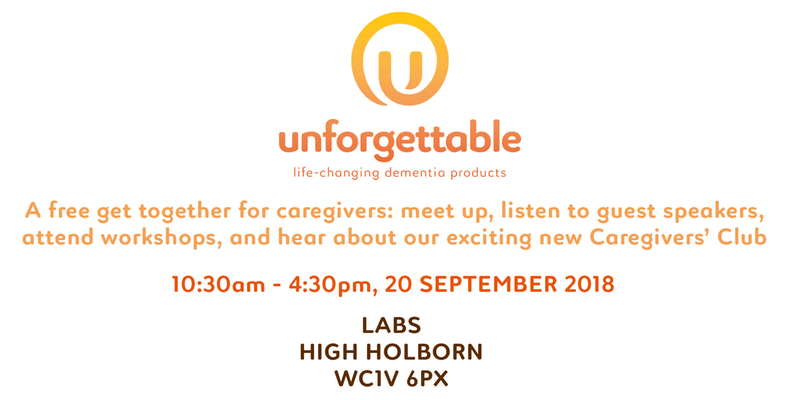 It is an opportunity for caregivers and people living with dementia to meet up, listen to guest speakers, attend workshops and hear about our exciting new Caregivers Club. A complimentary lunch and refreshments will be provided as well as an Unforgettable goodie bag including a mug and a free copy of our Family Guide to Dementia, worth £7.99. Our event will open at 10.30am and runs until 4.30pm and will feature demonstrations of our best-selling products and a series of interactive workshops delivered by our partner organisations. There will also be music provided by Mycal Miller with his Memories Disco. The full list is below, times TBC, but we will let you know by e-mail when times are confirmed.